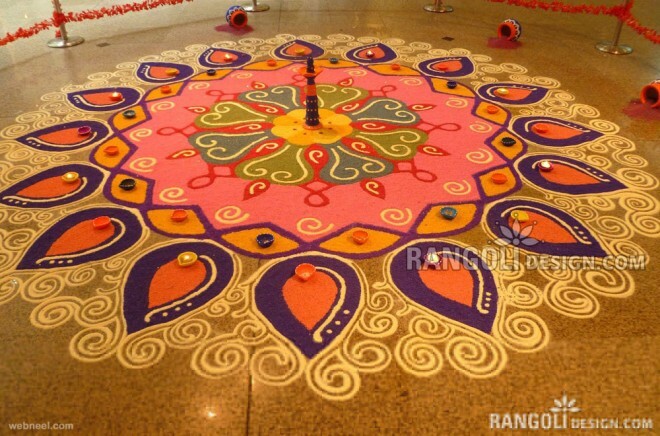 Stone Rangoli: This one is the simplest of all! You just have to place the market bought stones or rangoli pieces and design them in whatever pattern you like- circular, rectangular! This one is for the lazy bums like me or who doesn’t know the art of making rangoli. This is such a beautiful stone rangoli, the colors are so fresh and vibrant!! Another readymade stone rangoli desgin, I quite like the work on the pieces. Gorgeous black and green rangoli in rectangular pattern with diyas placed on the sides and in the centre! A beautiful peacock rangoli, needs some good art skills to make this one. It’s so beautiful, it will brighten up your whole home if you try making this! This rangoli is made with flowers, it looks quite tough but it’s just the pattern on the floor decorated with different flowers. This one also makes a good and easy one and lighten up some diyas at the corner or on all ends of rangoli to make it more stunning. Another beautiful colorful design! 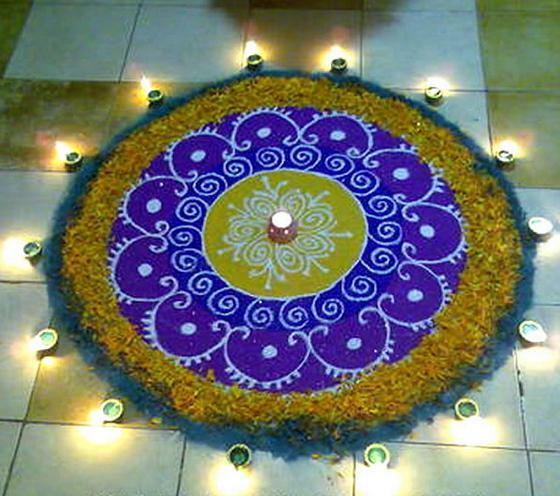 This rangoli design has a big diya in the centre and medium sized diyas decorated on the sides. It’s a combination of various colors which is what makes it more beautiful. Purple rangoli on black surface, what a lovely combination it makes! 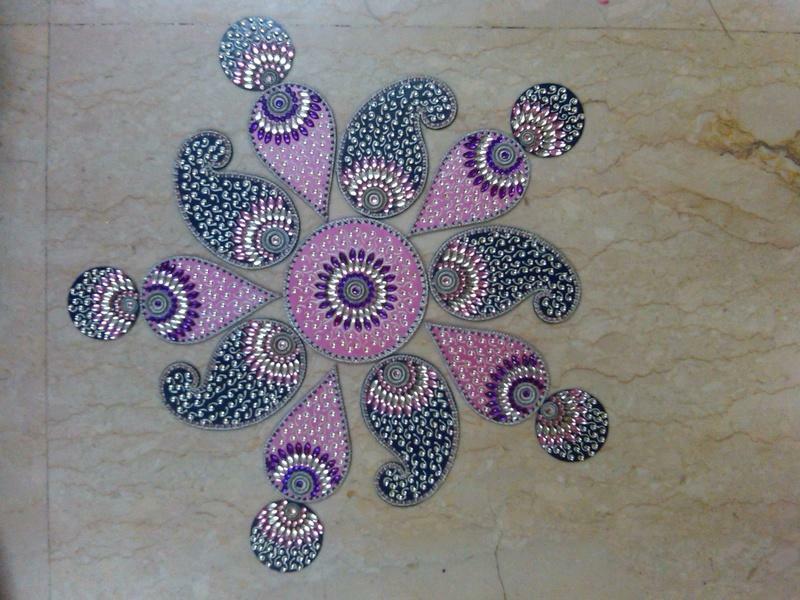 Rangoli design for the full floor. This rangoli is made almost on half the floor surface and is just so artistic! On the sides, matkas are laid with color popping out of them. See what unique ideas such rangolis give us. This rangoli gives such a festive feeling with all the flowers and diyas decorated in rangoli pattern. I always make one rangoli with different flowers and place diyas and candles on the sides, I just love the brightness and freshness it adds to my house. 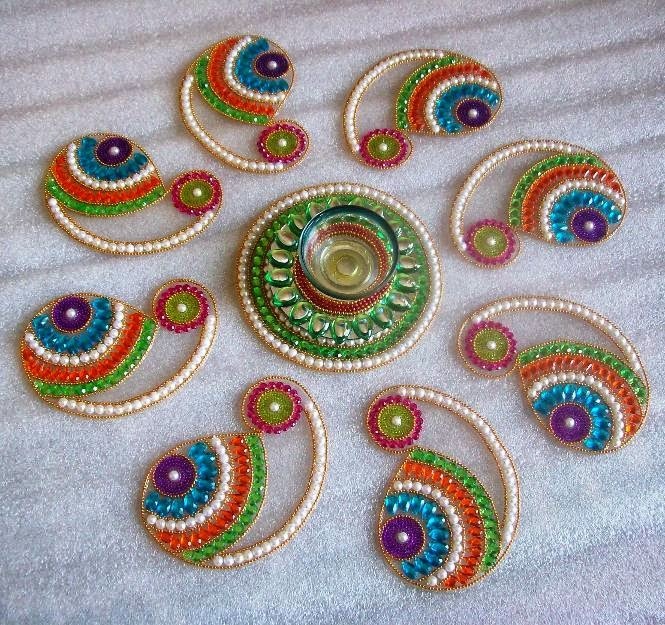 Rangoli designed with colors, flowers and diyas, perfect combination of everything. 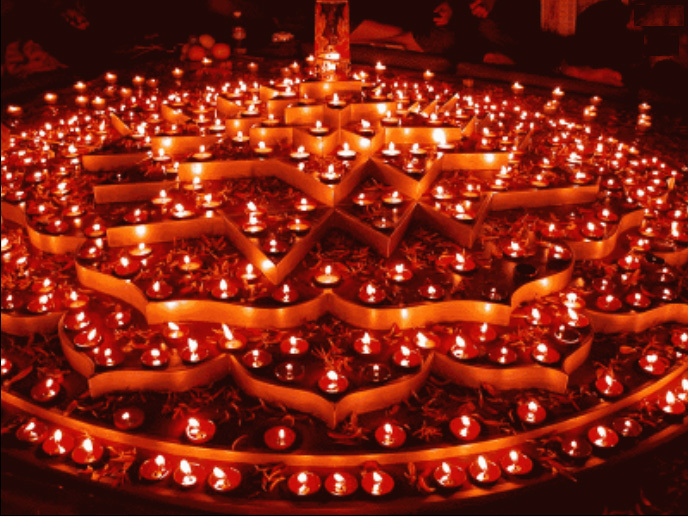 This is called the diya rangoli, You can simply decorate the diya in a certain order or align them on some raised surface of your floor which looks like a certain pattern. 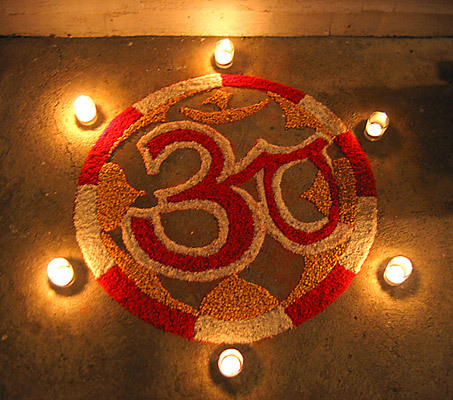 A beautiful ‘om’ rangoli, make an om and make boundaries on the ends either in a circle or in square, both looks equally good and then place some flowers and diyas or candles on all the corners to add more depth to the rangoli. A gorgeous swatsik rangoli!! Love the color combination of this rangoli! These are the few rangoli designs I found interesting. Hope you liked this post, don’t forget to share your comments on what rangoli design you liked the most!! Lovely post dear.. I have been hunting for rangoli design to make this year .. and this is reallly helpful!! Beautiful post hun. I was so mesmerized that I stared and stared and stared some more at them. I myself cannot draw up such beautiful designs but they are really beautiful. Beautifuuly compiled post Arzoo…I am so loving the Peacock Rangoli.. The big diya in the centre one is GORGEOUS!!!! Wow this is a perfect post for the occassion and I just love flower rangoli! Amazing designs! Previous Previous post: Makeup Products I Finished Using!